Inside the Data-Driven Farming Prize’s “haat bazar.” 27 May 2017. Photo by Kathaharu Studios. For two hours, the din associated with an actual marketplace poured out of a Kathmandu conference room. The Data-Driven Farming Prize’s 13 finalist teams became sellers straining to attract prospective buyers from among the invited participants. But how did data analysts, graduate students, and entrepreneurs transform into wily salespeople? Why was a simulated haat bazar a Data-Driven Farming Prize activity? Why is soliciting user feedback fundamental to the Data-Driven Farming Prize? On 9 February 2017, the US Global Development Lab’s Digital Development for Feed the Future team launched Feed the Future’s Data-Driven Farming Prize. The prize seeks tools and approaches that source, analyze, and translate data into actionable, timely, and context-specific information for smallholder farmers to improve agricultural productivity. That is, while satellite, weather, pest, and soil data have revolutionized industrial agriculture, it does not necessarily mean that the insights from this data are available or understandable to smallholder farmers. Nepal—where nearly 70 percent of the population farms—could transform its productivity and food security by bringing data-driven insights to smallholders. These insights, however, need to be communicated appropriately. While Nepal has high cellphone penetration, less than 30 percent of Nepalis have smart phones. Only 58 percent of adults are literate. Simply asking farmers to install and check a mobile app won’t cut it. To be successful, the competitors will need to take into account the daily lives, constraints, and unique demographic factors that will determine whether their interventions—however brilliant and well-intentioned—can be easily integrated into the lives of end-users. Human-centered design (HCD)—a process of consulting with end-users to get their input on a product or service to ensure it is appealing and fits into their lives—enables our competitors to answer these questions and develop better solutions. In order to ensure the innovations the Data-Driven Farming Prize is seeking are relevant to Nepali smallholder farmers, USAID has conducted continuous human-centered design processes. We started by ensuring the prize and judging criteria reflected feedback from Nepali smallholder farmers themselves. We asked farmers, extension officers, and inputs dealers if the lack of data was a problem, and, if so, what problems access to timely data might solve. We also asked questions about literacy, cell phone ownership and access, disposable income, and household decision-making. We then profiled these conversations in blogs so that competitors had a clear picture of their prospective customers. On the judging side, USAID ensured that the Prize’s judges noted whether the submitted solutions were responsive to the needs and daily lives of smallholders. Our conviction that comprehensive, responsive, and commercially successful innovation would occur only if the competitors collaborated with experts, Nepali farmers, and each other. After a flurry of questions and counterfeit Rupees changing hands, the haat bazar closed with our visitors counseling competitors on how to improve the relevance of their products. The competitors would do well to keep this counsel in mind. In the weeks following the workshop, they are required to test their solutions with smallholders. Our judges will prioritize smallholder feedback on the solution’s usability and their willingness to pay in their assessments. 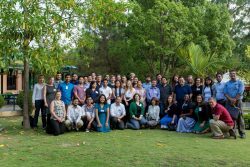 As a capstone, in early September 2017, the Data-Driven Farming Prize will reconvene our 13 finalist teams in Nepal. 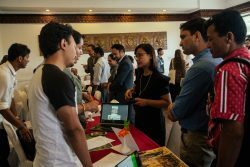 The teams will pitch their innovations to the judges and Feed the Future delegates, network with Nepali agriculture entrepreneurs, and participate in a second, extended haat bazar. Along the way, the teams will demonstrate the modifications they made to make their solutions more Nepali smallholder-appropriate. But this time we are not merely simulating a haat bazar. In the place of fake rupees, four winners will earn over US$300,000 in prize money and our finalists are keen to see their solutions in wide use. If this prize is truly successful, however, it is Nepali smallholders who will generate much more in revenue from productivity gains by using the winning solutions. Data-Driven Farming Prize competitors, partners, and USAID at the close of the co-creation workshop, Kathmandu, 28 May 2017. Photo by Kathaharu Studios. Feed the Future’s Data-Driven Farming Prize was launched on 9 February 2017. It offers $300,000 in prizes for tools and approaches that source, analyze and translate data into actionable, timely and context-specific information for smallholder farmers to improve value from agricultural productivity. USAID’s Digital Development for Feed the Future team took a pay-for-results approach because while confident that data-driven agriculture solutions exist, they wanted to pay only for those that addressed specific needs of Nepali farmers. Over 143 applicants applied to the prize, and now, 13 finalists are field testing their solutions. Winners will be announced 7 September 2017. 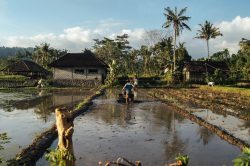 The Data-Driven Farming Prize is implemented by DAI LLC and Nesta’s Challenge Prize Centre. More information about the prize can be found at www.datadrivenfarming.challenges.org.